Remember, anyone can turn out a few racks of damn good ribs. You do not need a lot of special equipment, be of a specific gender or have a granddaddy from the hill country. Patience, desire and a heat source will do. Rule 1:Formulating Your Meaty Plan You will want to have at least 3 ribs per person. Some people might only eat two while others are endowed with a gene that allows them to consume an entire rack in one sitting. Rule 2: Don't Rush It If you allow yourself five hours of cooking time you won't be disappointed with tough, underdone ribs. Keep your grill/smoker at about 225 degrees. Rule 3: Stack 'em up. Stack your ribs up to three high so that one's steaming in the middle at all times. This exposes all the slabs to different types of heat so that none is getting too much dry heat. Every half hour or so, rotate the bottom rack to the top, the middle to the bottom and the top to the center. Putting a small pan of water in the coals will help ensure moist deliciousness as well. Rule 4: Create a distraction. You will not be able to keep enthusiastic guests from hovering, poking, prodding, offering unsolicited advice and second guessing your every move unless you distract them. A few Basque Coils and a little salumi set out ahead of time go a long way in keeping too many cooks out of your outdoor kitchen. Sign up for the newsletter now, and know the meaty treats of the week. 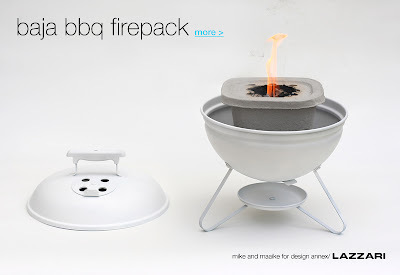 I doubt this spiff little Lazzari box-o-charcoal will keep the heat on the ribs for 5 hours, but it sure is pretty. Via Treehugger. 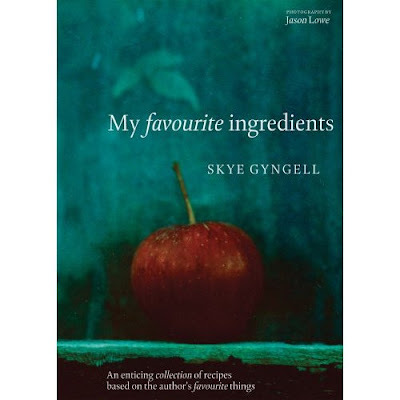 Quite tempted to buy this book by Skye Gyngell for it's cover. Quite. Um, yes. Yes I will use the newly thrifted, hand cranked Atlas pasta machine to make pasta wrappers for ricotta with basil and black olives. But I think I will put them in a caramellized onion/ butter sauce deglazed with lots of white wine & reduced. Adapted by Foodbeam from Jamie Oliver's recipe. Crack the eggs into a small bowl and mix with a fork. Place the flour in a bowl, make a well in the centre and pour the eggs over. With the tips of your fingers, mix the eggs with flour until everything comes together. It is now time to knead the dough until soft and smooth. To do this, I usually divide the dough in four, mix each ball separately, and then combine the balls into a big one. Wrap the ball in cling film and put in the fridge for at least half an hour – just enough time to make the filling! Separate the larger basil leaves from the smaller ones (that you will keep in a bowl of cold water for decoration). Finely chop the big basil leaves and put half of them in a bowl (the rest will be used in the sauce – see below) with the ricotta, grated nutmeg, olives and parmesan. Season with salt and pepper and add a splash of olive oil. 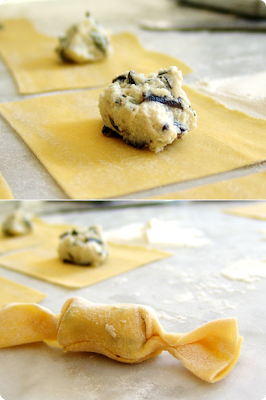 Roll the pasta dough, one small ball at a time and cut into 10×6cm rectangles Place a teaspoon of filling in the middle and brush lightly with water. Roll up and pinch hard to secure each end. Keep on a flour-dusted tray in the fridge until you need them. Repeat until all the dough/filling is used. Gently heat the butter with a splash of olive oil in a saucepan. When the butter starts to foam, add your sliced garlic and the rest for your chopped basil. A minute later, add the tomatoes. Bring to the boil and simmer for five minutes, until softened. Taste and season with salt and pepper and a swig of balsamic vinegar. Bring a large pot of salted water to the boil and add the caramelle. Cook for 2 to 3 minutes, until they begin to float, then carefully remove them to a colander using a slotted spoon. Add the caramelle to the sauce and gently toss. Sprinkle with a handful of grated parmesan, the shake around and cover for 30 seconds. Divide between plates and sprinkle with the drained basil leaves. After a total yoga failure at lunch, I stopped by AG Ferrari in order to obtain a Pellagrino. I bought 10 hardcandies from Pastiglie Leone, their Regal Torinos. Snips from the latest Meatpaper Newsletter. Subscribe to the mag now! * Save the date: July 20, 2008! We’re partnering with Gastronomica magazine for a summer issue launch party at Perbacco restaurant in San Francisco. Join us for tastings by chefs Staffan Terje of Perbacco, Chris Kronner of Serpentine and Slow Club, Leif Hedendal Vegetarian Cuisine, and more. Enjoy beverages from Verge Syrah, Trumer Pils, Bluecoat Gin, La Fee Absinthe, Rhum Clement, and others. Plus: live gypsy jazz by Gaucho. Stay tuned for details. * Issue Four lands in bookstores and mailboxes mid-June. SUBSCRIBE NOW and you’ll be the first to find out about the global politics of chicken wings, animal cannibalism in the children’s books of Richard Scarry, plus the beefytini, weeniecello, and other adventures in mixology. More on this topic soon...thinking lots about local, Comfort Food Club, and my kitchen as studio. 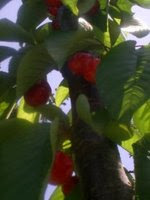 From Forage Oakland, who is trying to entice cherries: These are images from cherries from two trees in North Berkeley. I have hand delivered letters to the proprietors of these homes, and I hope to receive a response any day. I have a large Meyer lemon tree in the Mission/ SF. Not really any lemons now, but there sure will be. Herbs in the backyard pots, happy to share small quantities with nearby neighbors. 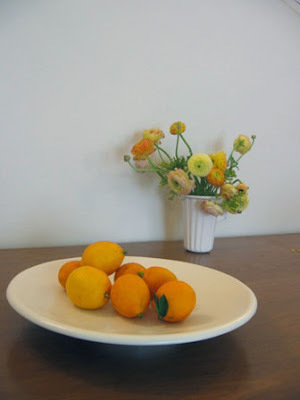 Interested in stone fruit (especially plums and apricots) and unusual citrus varieties. Always willing to trade fruit for preserves. Will report on the much-anticipated outcome. (Good) food on the interweb. Harumph. The NYT has a round-up of local food access points. Just which local, exactly, is a bit ambiguous...I assume local meant NYC, but no. At the end of the article the author is placing a standing order with my beloved Farm Fresh To You. (Gold star for that.) I was surprised to read this on FFTY's web site today: "Currently over 800 families are participating in our family farm's CSA, Farm Fresh To You." I feel like I must know one eighth of their customers. I assumed they delivered thousands of boxes a week. Michelle Slatalla did introduce me to Spud, which delivers in Seattle, SF, LA & Portland. They'll deliver Strauss glass bottle milk to my house. Distance feature is awesome. Clicking on Strauss shows "This supplier is located 52 miles from our San Francisco warehouse." Still, unless they'll deliver the big jars of A Bientot plain yogurt too, they're not the magical wonderland I'd hoped for. Hrm...bakery section notably missing Acme bread. Household section missing Mrs. Meyers. What online platform would work best to connect tens of thousands of individuals and organizations (for-profit and non-profit) in a long-term campaign to create a sustainable, non-exploitative food system in California? 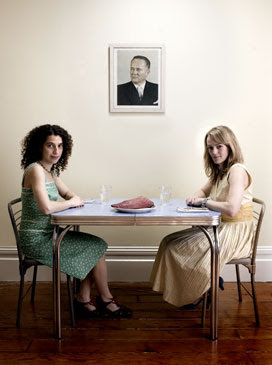 Ms. Puett sees the refrigerator as just as valid a territory for thoughtful arrangement as any other part of the house. "It's a really fun game," she said. "It makes moving through the banalities of life stimulating." Good heavens, J. Morgan Puett must be an interesting person. Ooooh...and her kitchen is a showcase for her vintage chemist's glassware.